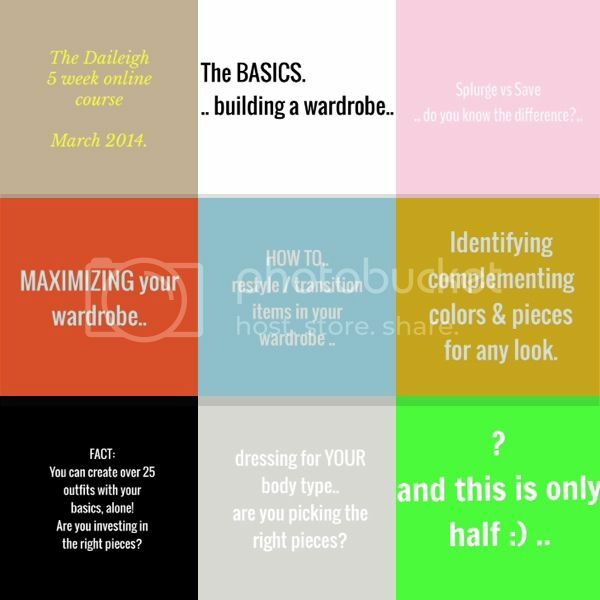 The Daileigh 5 Week Online Course! I'm sure you guys keep seeing my brief mentions of the 5 week online course that I will be instructing and for those that have been follow my social media pages, you have been getting more updates. I am excited to share with you guys that starting at the end of March I will be teaching an online course that is designed to provide you with the tools, tips, how to's, valuable knowledge and much more on how to better style yourself, create looks and get the most out of what you already without constantly having to spend! It's not all about shopping and price tags (for me) it's about taking what you already have, add to it and maximize it. Being a stylist, I love working with clients to create looks that cater to them and making them feel better about their wardrobe choices so I am VERY VERY excited to be working with some of my readers on a more personal level to share some of the many tricks I have up my sleeve. Registration is now open with limited availability. I want to be stylist! I recently started blogging to express my passion for fashion, considering none of my friends are into it like I am! I LOVE Fashion! I was wondering how you became a stylist? What's a day like for you? Pros& cons? Thanks! By the way, I think this is a great idea!